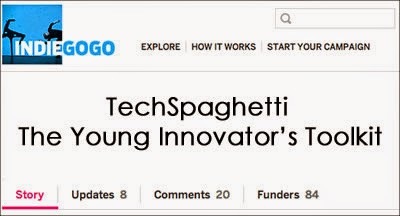 TechSpaghetti is launching The Young Innovator’s Toolkit and a startup campaign to raise awareness and funding for the tools on a variety of levels. The startup plans include the launch of classroom video lessons in August followed by the release of a home-based app in December. TechSpaghetti supports the Apple platform. Here is a description from Alex Peckman from TechSpaghetti. In our first lessons series, “And then there was a sound that nobody was expecting..…”, children learn about how music and sound be used to create a mood and illustrate a story. They then learn how to apply these ideas to their own story and are taught how to use sound editing software such as Garageband in order to create their own dramatic soundtrack and bring their story to life.